Holste-Oldendorf, Germany -- Bear Family Records – the German-based independent record label that has served music fans around the world with some of the most comprehensive collections in all of music – is celebrating its’ 40th anniversary this fall. Known for their wonderful bluegrass collections including numerous boxed sets of Bill Monroe, Carl Story, Dave Macon, and Flatt & Scruggs and many other outstanding artists. Bristol, TN/VA -- East Tennessee State University and Birthplace of Country Music present Johnson City Sessions Weekend, October 17-20, 2013, an event-packed weekend celebrating the release of Johnson City Sessions 1928-1929 "Can You Sing or Play Old-Time Music" CD Box Set, remastered by Bear Family Records. Bristol, TN/VA -- Last April, Cybergrass reported on the John City Sessions project. 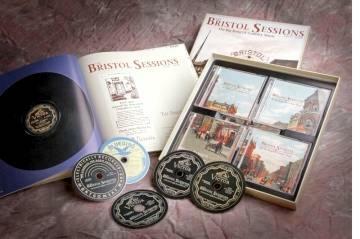 The project is a young sibling of sorts to the Birthplace of Country Music's The Bristol Sessions. The Birthplace of Country Music (BCM) and East Tennessee State University (ETSU) are working together for the Johnson City Sessions Weekend to be held October 18-20. Bear Family Records is presenting Johnson City Sessions: Can You Sing Or Play Old-Time Music? due that October weekend. Bristol, TN/VA -- The Bristol Sessions 1927-1928: The Big Bang of Country Music Box Set has received two Grammy nominations in the Best Historical Album and Best Album Notes categories. The compilation was released by Bear Family Records in March of this year.